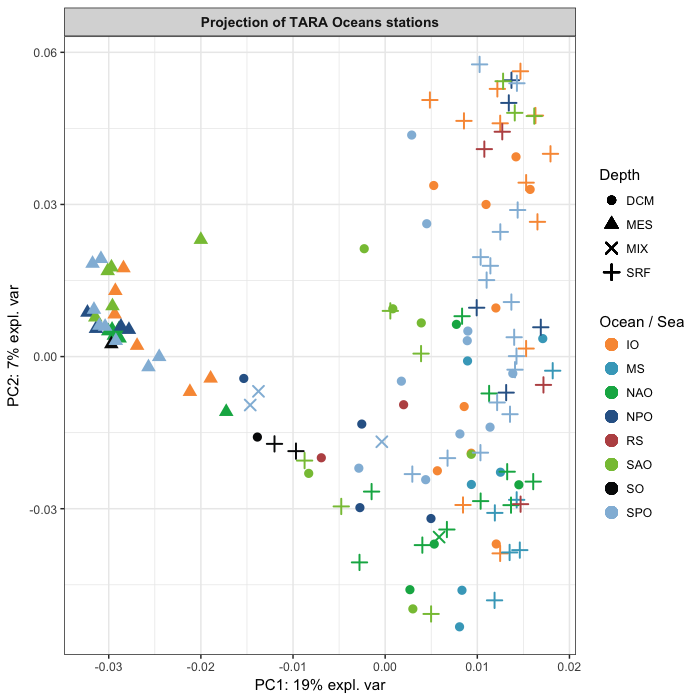 The TARA Oceans expedition facilitated the study of plankton communities by providing oceans metagenomic data combined with environmental measures to the scientific community. 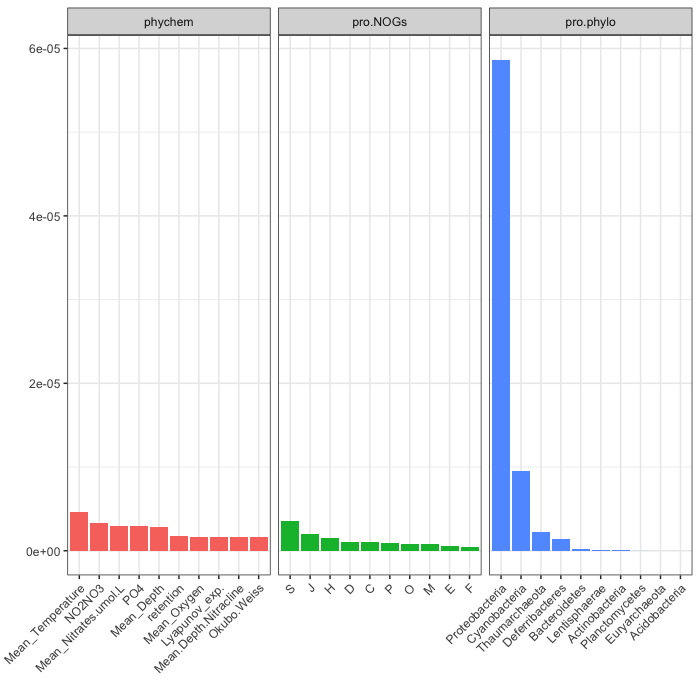 This study focuses on 139 prokaryotic-enriched samples collected from 68 stations and spread across three depth layers: the surface (SRF), the deep chlorophyll maximum (DCM) layer and the mesopelagic (MES) zones. Samples were located in 8 different oceans or seas: Indian Ocean (IO), Mediterranean Sea (MS), North Atlantic Ocean (NAO), North Pacific Ocean (NPO), Red Sea (RS), South Atlantic Ocean (SAO), South Pacific Ocean (SPO) and South Ocean (SO). In this vignette, we consider a subset of the original data analysed in the manuscript from our collaborators Mariette & Villa-Vialaneix (INRA Toulouse, France). 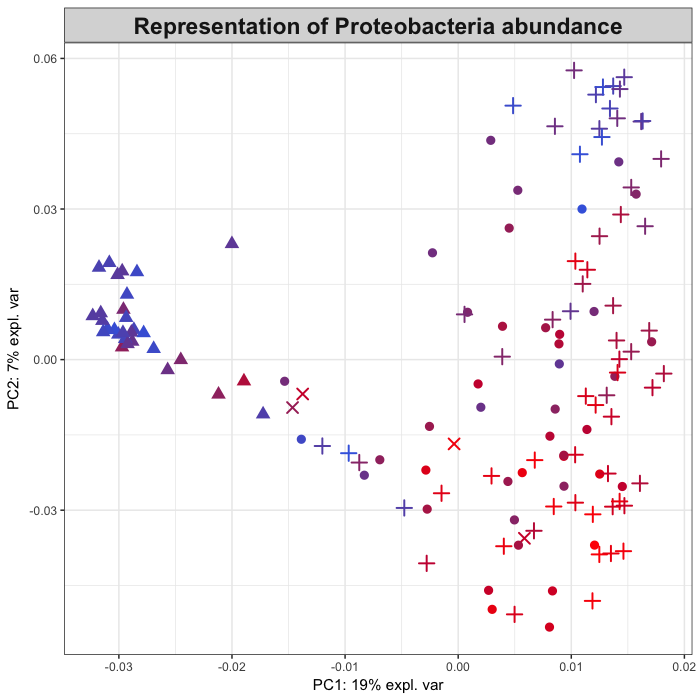 The data include 1% of the 35,650 prokaryotic OTUs and of the 39,246 bacterial genes that were randomly selected. The aim is to integrate prokaryotic abundances and functional processes to environmental measures with an unsupervised method. To run the following code, install the latest version of mixOmics and mixKernel. For each input dataset, a kernel is computed using the function compute.kernel with the choice of linear, phylogenic or abundance kernels. A user defined function can also be provided as input(argument kernel.func, see ?compute.kernel). The results are lists with a 'kernel' entry that stores the kernel matrix. The resulting kernels are symmetric matrices with a size equal to the number of observations (rows) in the input datasets. 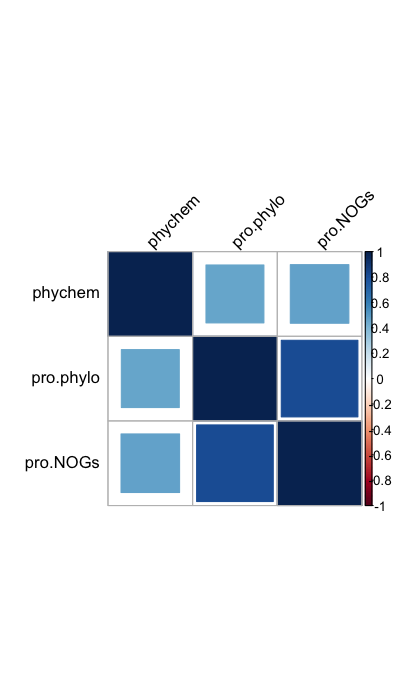 The figure shows that pro.phylo and pro.NOGs is the most correlated pair of kernels. This result is expected as both kernels provide a summary of prokaryotic communities. The function combine.kernels implements 3 different methods for combining kernels: STATIS-UMKL, sparse-UMKL and full-UMKL (see more details in Mariette and Villa-Vialaneix, 2017). It returns a meta-kernel that can be used as an input for the function kernel.pca (kernel PCA). The three methods bring complementary information and must be chosen according to the research question. The STATIS-UMKL approach gives an overview on the common information between the different datasets. The full-UMKL computes a kernel that minimizes the distortion between all input kernels. sparse-UMKL is a sparse variant of full-UMKL but also selects the most relevant kernels. A kernel PCA can be performed from the combined kernel with the function kernel.pca. 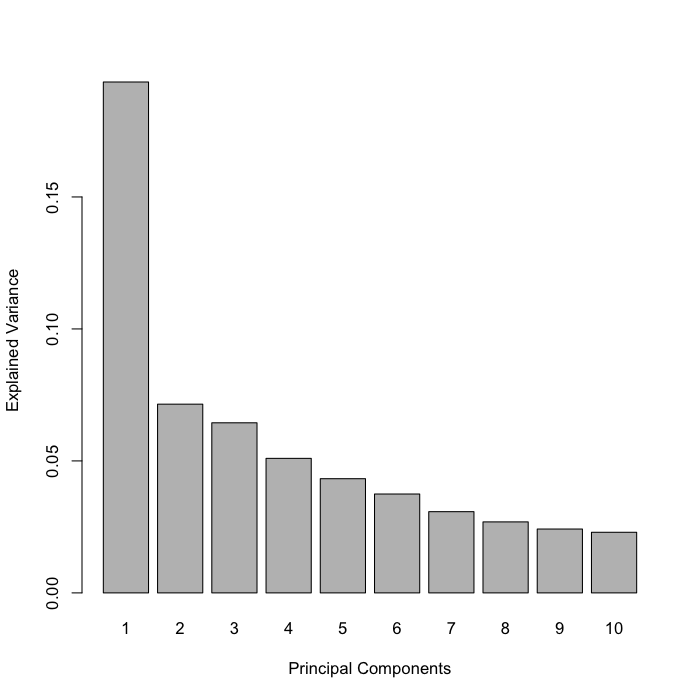 The argument ncomp allows to choose how many components to be extracted from KPCA. 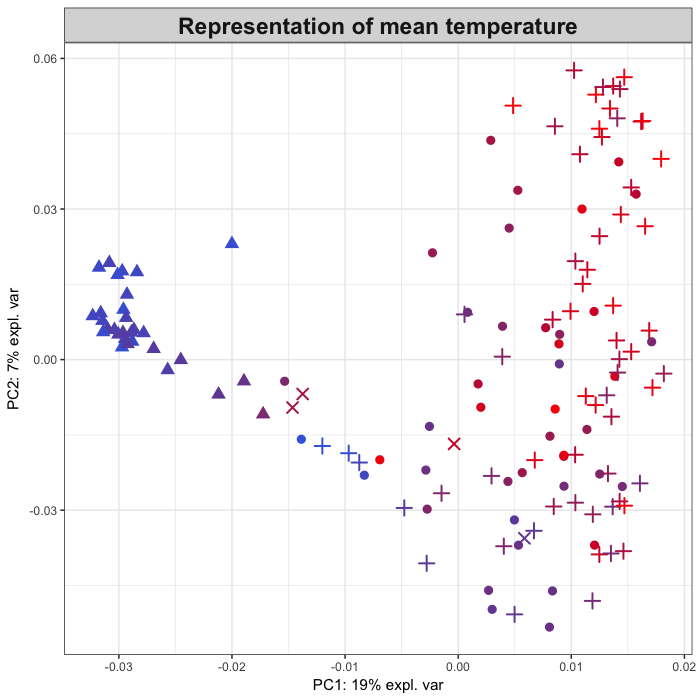 The explained variance supported by each axis of KPCA is displayed with the plot function, and can help choose the number of components in KPCA. The first axis summarises ~ 20% of the total variance. Here we focus on the information summarised on the first component. Variables values are randomly permuted with the function permute.kernel.pca. ##   NA  NA  "K" NA  NA  "S" "S" "S" NA  "S"
Proteobacteria is the most important variable for the pro.phylo kernel. Zhuang, J., Wang, J., Hoi, S., and Lan, X. (2011). Unsupervised multiple kernel clustering. Journal of Machine Learning Research: Workshop and Conference Proceedings, 20, 129–144. Lavit, C., Escoufier, Y., Sabatier, R., and Traissac, P. (1994). The act (statis method). Computational Statistics & Data Analysis, 18(1), 97 – 119.